I had a literal run-in with a pepco truck back in July and Pepco has decided to deny my claim on the grounds of no evidence. I’m wondering if anyone has any advice or suggestions, should I just pay for the damage myself and move on? The basic scenario is that I was driving in a lane next to a pepco truck and after we both made a turn, one of the side doors swung open hitting my car and creating a several inch long gash/dent. Their lane of traffic was moving faster than mine and the truck continued without stopping. My lane was not moving thus by the time I realized what had happened I could not catch up to get the truck ID number. I went through the official Pepco claims process and am still waiting for the appraisal report but based on past experiences its probably around $500 (also the amount of my insurance deductible). All along I was told that as long as they could determine there was a pepco truck in the area at the time I reported it they would be able to fund the claim. 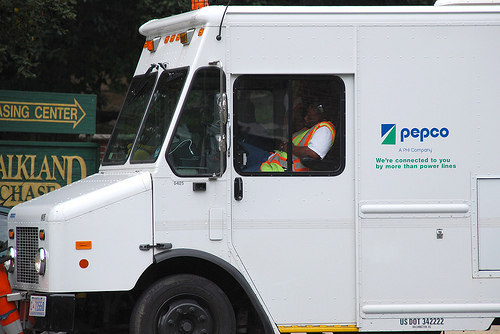 The incident happened during rush hour a few days after the derecho, so there were MANY pepco trucks driving on that particular stretch of Connecticut Ave at that time. I have now been told that because no driver or crew has reported this incident that they will be unable to fund my claim. This seems a little rediculous, but I am not sure if it is worth pursuing further. My thoughts are that if it was a private individial who had done this – hit my car with theirs and drove off, that would be considered a crime. Now I know that it was a Pepco truck that did this but yet I have no “proof” other than seeing the truck myself, but it seems to me like they should have to pay for the damage, and more importantly as a public utlity they should hold themselves to a higher standard of accountability in cases like this.